While lesbians shot home movies and amateur films well before Stonewall, the idea that making sexual identity public was essential to winning civil rights changed filming friends and lovers into a radical act, altered the way participants behaved in front of a camera, and changed what the women behind the cameras shot. For lesbians the women’s movement played a role in that as well. In LHMPs earliest footage, the friends who smile and cavort before the camera occasionally hint at their sexual identities, say, by daring a beret & a pea coat. But for the most part they are passing. Stonewall & the women’s movement put an end to the quiet well-mannered request for rights. Women began to show off strength instead of decorum. LGBT people and allies took to the streets in all our wild glory, eager to be filmed, seeking out, even toting, cameras. That willingness to be seen and recorded, along with the desire to be together, spilled over into countless performances, potlucks, gatherings, fundraisers, parties, camping trips, meetings, conferences, house parties, dances that that lasted from one march to another and took place all over the country. As relatively cheap video casssette recorders became available in the late 1970s, more and more of these events could be recorded cheaply, and they were. You could say the 1970s enjoyed a perfect synchrony between social movements and technological change. That’s why there’s so much documentary footage of marches and demos that mainstream media persistently ignored. A wealth of other footage exists as well — amazing footage shot in private homes, on womyn’s lands, and at events restricted to women only. 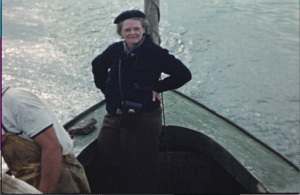 Thanks to the CLIR grant, in the last year Lesbian Home Movie Project has been able to digitize two such extraordinary tape collections — the Corky Culver Collection and the Shirley Lasseter Collection. Together they include almost two hundred reels and document the extraordinarily rich and important history of lesbian and feminist progressive actions and gatherings in the south from anti-nuclear marches to cronings, lesbian variety shows to retreats. Lesbian Home Movie Project holds, for example, recordings of eighteen amazing lesbian variety shows that took place in Gainesville, Florida, every year but the first & 2000 when no LVS took place — one from the Corky Culver Collection, 17 from the Shirley Lasseter Collection. You haven’t seen anything until you’ve seen a lesbian variety show. Here’s a taste from a comedy routine in the Shirley Lasseter Collection. The variety shows also include fabulous chorus numbers, dance routines, singers as well as comedy skits. Despite the occcasional gaffe, overall these tapes represent a unique resource for historians of the future. They constitute an extraordinary video record of the lesbian wing of the lgbtq movement, the grassroots bands of friends and lovers, singers, drummers and strummers, carpenters and kayakers, dancers and speechifiers, skiers and sailors who together won and continue to defend lgbtq rights, keeping lesbian spirit strong from one pride march to the next. While these were often large events with dozens of women on stage and hundreds of women in the audience, on the dance floors, or sitting in camp chairs and on blankets under canopies of trees, they were not altogether public events. 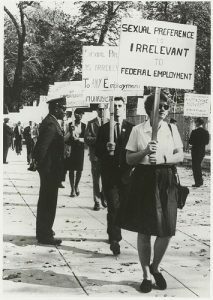 They took place on private property and they were often restricted to women only. Moreover, gifted and skilled though they often were, the videographers were amateurs, not professionals. 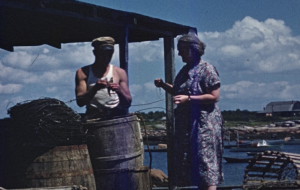 Much as home movie makers shot their films to show to the same families who participated in making them, these videographers intended to preserve the events for their own communities — in essence, their extended families, which often were womyn-only. They did not collect releases. They did not keep track of participants’ names. Why would they? At the time, it felt as though everyone would always be together. Weren’t they the pioneers of a lesbian nation? These communities did not remain together, however. Women moved. They changed their names. They rethought their identities and their politics. The footage remains, however, and the more things have changed, the more important is it. It’s the evidence of what was. It’s all there: the ebullience, the affection, the passion, the humor, the hope, the furious determination to the change the world. There’s only one problem and it’s archival. We need participants’ permission to share them widely, especially to stream. For that reason, I’ve just spent the better part of a year trying to locate and collect permissions from the participants in the Corky Culver and Shirley Lasseter Collections. In that this put me in contact with a lot of wonderful women, it was well worth the time. But asking a yes or no question — asking permission — is dicey. And while the lesbian nation has gone the way of Camelot, the idea that no man will ever see certain expressions of lesbian freedom remains dear to many women. In any case, I have finally accepted, there’s no finding every single woman who appears in every single frame of these collections. The best we can do at this point is honor the requests of those women we’ve been able to find; assume that the most common restrictions voiced would likely be posed by the majority of women who appear in the footage; respect those restrictions unless we have specific permission not to; and continue the search for the remaining participants largely as traditional archives do — by streaming bits of footage and inviting participants to let us know if they’re not okay with that. Unfortunately, it’s clear that women who chose to live in separatist communities or live as lesbians only in separatist circumstances would typically not choose to expose their lesbian selves to the klieg lights and trollery of today’s social media and that means that the better part of wisdom must mostly consign that footage to the cool dark of the vault until we’re all gone. I only see one way around that. Showing the footage under conditions close to those in which it was shot. 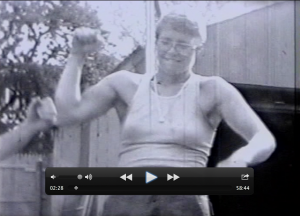 Last winter Lesbian Home Movie Project held a few private screenings here at our archive. We have a couple of similar screenings in the works in Florida for next year and we’ll be screening some footage we can’t put on the web for PRIDE in Portland, Maine, June 9th. We’d like to do many more screenings like that. Any takers? Any funders? Any objections? Are you looking for more home movies with lesbians? I may have some from the 1970s…..if that is what you are looking for. I was also involved in a documentary with my two sons. There was also a lesbian couple and a single mother like myself (as well as some gay men). The film was titled Not AllParents Are Straight. It came out in1986.